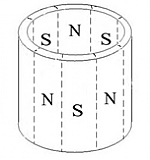 Traditionally, multi-pole ring magnets were created using multiple arc magnets glued to the assembly. While spinning, it was not uncommon for the adhesive material loosen and the magnet would dislodge itself. Also, the requirements for exact accuracy between all of the magnets in the ring shape to have the exact same physical and magnetic properties - thus many magnets would fail because of the high requirements. But because of the technological limitations, for years there was no good solution. Now there is a better way to create circular magnets. By creating just one single magnet specifically designed for your application, we are able to provide your company a product that is stronger, more reliable, and more efficient. The magnets are multi-pole - which does not compromise the magnetic properties. Contact your Alpha Magnet sales representative to learn more about how this technology may help your company today!